July 2017: There is an FPA Traders Court guilty vote against this company. The FPA recommends caution dealing with Expertrada until this issue is resolved. Expertrada is a forex broker. 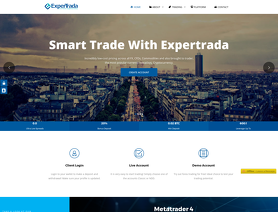 Expertrada offers the Expertrada forex trading platform. Expertrada.com offers a number of forex pairs and bitcon for your personal investment and trading options. not pay for the profit..
they will claim at your fault since there is no trade rules.But if you lost it was okay. operating in malaysia and can open account all over the world because it use Bitcoin address for deposit.